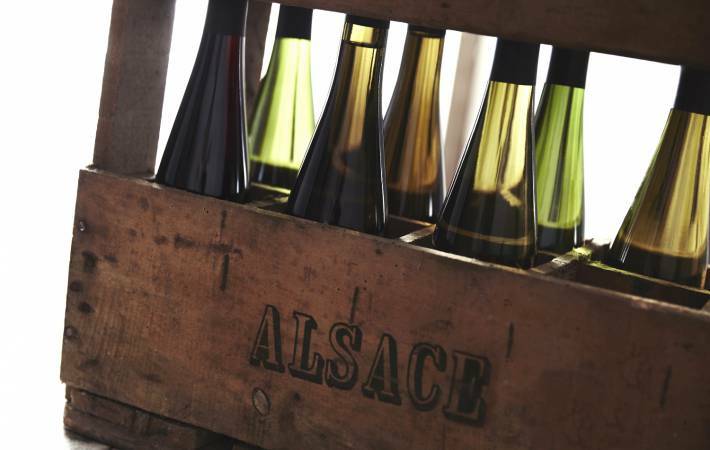 Following on from a scorching summer, this vintage year will go down in Alsace wine history as being a vintage year with extraordinary earliness … literally. Because you have to return to 1540 to find comparable weather conditions! We could almost forget that it’s nature who decides on a vintage year’s quality. In 2003, it got a real kick out of reminding us! As opposed to the trend of these last years, the 2002/2003 was harsh with long periods of frost in January and February. In March, the mild temperatures allowed for early budding at the beginning of the month of April. Winter still reared its head during this period with spring frosts which caused damage in the early-ripening parcels. Then the exceptional temperatures recorded during the months of May and June resulted in the flowering being three weeks early, which happened in a very consistent manner around June 3. Summer was particularly warm and dry. During the month of August, temperatures were over 40°C for nearly 15 days! The rainfall was little, even non-existent, forcing the vines to use their deep-rooted water reserves which entailed delayed ripening on light soils. Some sectors of the wine-growing region also suffered from hail storms causing serious damage. Of course all these factors contributed to rethinking the predicted volume of harvestable grapes and most of all to reinforce the ripeness process. From a quality standpoint, the grapes had excellent health maintained by the unusual dryness during the summer which curbed the development of cryptogrammic diseases. This year the low acidity of must justified the authorisation of acidification, exceptionally granted by the European Union. September 15 for the Vendanges Tardives and Sélections de Grains Nobles indications. The overall volume harvested reached 1,004,000 hl, down from 18% compared to last year. This volume includes 822,900 hl (- 19%) for AOC Alsace, 40,500 hl (- 8%) for AOC Alsace Grand Cru and 140,000 hl (-15%) for AOC Crémant d’Alsace. If the production of Vendanges Tardives (15,400 hl) is up slightly, the excellent health state considerably limited the possibility of producing Sélections de Grains Nobles (1000 hl). Despite uncertainties related to unequal ripeness and the difficulties with vinification, this vintage year has some great surprises in store. Sylvaner and Muscat d’Alsace are part of these surprises with ripe grape properties. Pinot Blanc and Auxerrois, whose acidity quickly dropped, were harvested very fast in August. Riesling benefited from some little rainfall at the beginning of the month of September allowing it to glide over the delayed ripening hurdle encountered here and there on light soils. Wines from this variety are the great successes of this vintage year. Pinot Gris and Gewurztraminer are rich with low acidity. Pinot Noir fully took advantage of the exceptional climate and has some beautiful colours. 2003 was an all-out extreme vintage year with a heat-wave summer requiring very early harvest but which produced balanced and often atypical white wines as well as particularly coloured red wines. The wines intended to be consumed quickly were harvested early, allowing them to preserve enough acidity but their fragile balance often resulted in quick ageing. The most successful cuvées were once again those which were harvested later, allowing for perfect psychological ripeness risking high alcohol levels, even sensitive residual sugar. An example with two wines harvested later and aged on their lees for a long time.